We got an email earlier today from KAMERAZ. For those living in Johannesburg, South Africa you may know them at the guys with the weird radio ads on Talk 702. They regularly have an event called Super Sunday where photographer exhibit and sell images while there are great deals and workshops on the go. 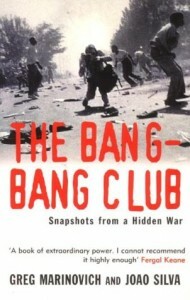 This Sunday Greg Marinovich – co-author of the book “Bang Bang Club” will be at Super Sunday. More details after the break. We also hope to have a former member of the Police Reaction Unit, that use to patrol the townships as a young conscript from early to late 1980’s. He’ll touch on the difficult relationship between the police and the press, and how reading the book altered his perception. This is an unique and very special opportunity that might not happen again, so we are looking forward to a large, enthusiastic turnout that is deserving of the book and its authors. Books will be on sale at R149, as well as specially signed first edition hard cover copies.